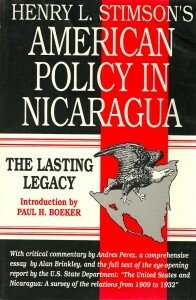 Perhaps the most illuminating document ever published on American foreign policy in Nicaragua, this book represents a full spectrum of critical perspectives. Henry Stimson’s memoirs as a special envoy to Nicaragua, first published in 1927, are reprinted here in their entirety. Also included is the full text of the U.S. State Department’s “The United States and Nicaragua: A Survey of the Relations from 1909 to 1932.” Then, as now, we read about a president named Chamorro, a revolutionary named Sandino, and U.S.-supervised elections. Stimson was commissioned to bring peace and democracy to Nicaragua; most Nicaraguans still think he brought only the Marines and the Somoza dictatorship. Henry L. Stimson held several posts as the United States Secretary of War and Secretary of State. Paul Boeker, a verteran career diplomat, has held key policy posts under both Democratic and Republican administrations, including his appointments as Ambassador to Bolivia and Jordan. Since 1988 Paul Boeker has been president of the Institute of the Americas, a California-based center that promotes understanding of and seeks practical solutions for significant problems facing the Western Hemisphere.